This article uses some professional terms to describe relative positions and directions. See Anatomical terms of location for more detailed information. In human anatomy, the clavicle or collar bone is classified as a long bone that makes up part of the shoulder girdle (pectoral girdle). It receives its name from the Latin clavicula ("little key") because the bone rotates along its axis like a key when the shoulder is abducted. This movement is palpable. In some people, particularly females who may have less fat in this region, the location of the bone is clearly visible as it creates a bulge in the skin. 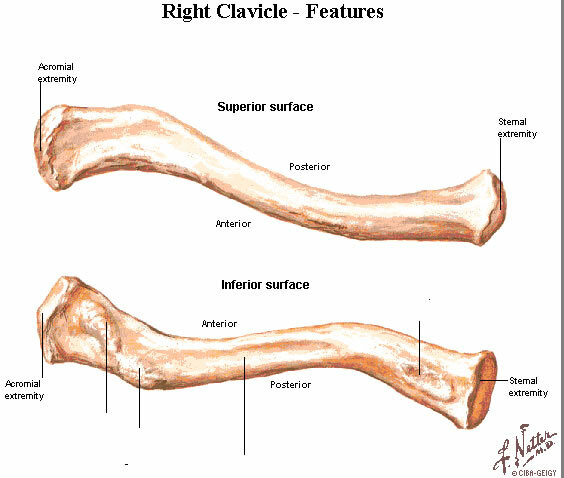 Right clavicle - from below, and from above. Left clavicle - from above, and from below. The clavicle is a doubly curved short bone that connects the arm (upper limb) to the body (trunk), located directly above the first rib. It acts as a strut to keep the scapula in position so the arm can hang freely. Medially, it articulates with the manubrium of the sternum (breast-bone) at the sternoclavicular joint. At its lateral end it articulates with the acromion of the scapula (shoulder blade) at the acromioclavicular joint. It has a rounded medial end and a flattened lateral end. From the roughly pyramidal sternal end, each clavicle curves laterally and anteriorly for roughly half its length. It then forms a smooth posterior curve to articulate with a process of the scapula (acromion). The flat, acromial end of the clavicle is broader than the sternal end. The acromial end has a rough inferior surface that bears prominent lines and tubercles. These surface features are attachment sites for muscles and ligaments of the shoulder. The collarbone, also called the clavicle, is the bone over the top of your chest, between your breastbone (sternum) and shoulder blade (scapula). It is easy to feel the clavicle, because unlike other bones which are covered with muscle, only skin covers a large part of the bone. Clavicle fractures are extremely common. Broken collarbones occur in babies (usually during birth), children and adolescents (because the clavicle does not completely ossify, or develop, until the late teens), athletes (because of the risks of being hit or falling), or during many types of accidents and falls. It serves as a rigid support from which the scapula and free limb are suspended. This arrangement keeps the upper limb (arm) away from the thorax so that the arm has maximum range of movement. Transmits physical impacts from the upper limb to the axial skeleton. Even though it is classified as a long bone, the clavicle has no medullary (bone marrow) cavity like other long bones. It is made up of spongy (cancellous) bone with a shell of compact bone. It is a dermal bone derived from elements originally attached to the skull. The clavicle is the first bone to begin the process of ossification (laying down of minerals onto a preformed matrix) during development of the embryo, during the 5th and 6th weeks of gestation. However, it is one of the last bones to finish ossification, at about 21-25 years of age. It forms by intramembranous ossification. It consists of a mass of cancellous bone surrounded by a compact bone shell. The cancellous bone forms via two ossification centres, one medial and one lateral, which fuse later on. The compact forms as the layer of fascia covering the bone stimulates the ossification of adjacent tissue. The resulting compact bone is known as a periosteal collar. The clavicle varies more in shape than most other long bones. Occasionally, the clavicle is pierced by a branch of the supraclavicular nerve. The clavicle is thicker and more curved in manual workers, and the sites of muscular attachments are more marked. The right clavicle is usually stronger and shorter than the left clavicle. The clavicle first appears as part of the skeleton in primitive bony fishes, where it is associated with the pectoral fin and with a vertically placed bone called the cleithrum. In such fish, the paired clavicles run behind and below the gills on each side, and are joined by a solid symphysis on the fish's underside. They are, however, absent in cartilagenous fish and in the vast majority of living bony fish, including all of the teleosts. The earliest tetrapods retained this arrangement, with the addition of a diamond-shaped interclavicle between the base of the clavicles, although this is not found in living amphibians. The cleithrum disappeared early in the evolution of reptiles, and is not found in any living amniotes, but the interclavicle is present in most modern reptiles, and also in monotremes. In modern forms, however, there are a number of variations from the primitive pattern. For example, crocodilians and salamanders lack clavicles altogether (although crocodilians do retain the interclavicle), while in turtles, they form part of the armoured plastron. In birds, the clavicles and interclavicle have fused to form a single Y-shaped bone, the furcula, or "wishbone". The interclavicle is absent in marsupials and placental mammals. In many mammals, the clavicles are also reduced, or even absent, to allow the scapula greater freedom of motion, which may be useful in fast-running animals. A portrait of actress Maggie Grace, her right clavicle clearly visible. ^ a b c Romer, Alfred Sherwood; Parsons, Thomas S. (1977). The Vertebrate Body. Philadelphia, PA: Holt-Saunders International. pp. 184–186. ISBN 0-03-910284-X. The clavicle is a long bone that is part of the shoulder. It connects the arm to the main part of the body. It is a support for the scapula bone and helps the arm to hang freely. This allows the arm to have a lot of movement. The clavicle is made from sponge-like bone, called cancellous bone, and is covered with a hard shell of bone.